In this blog post, we will highlight the effects of using the color YELLOW. As you can see above, yellow is a color of optimism and clarity. Yellow is the color of intellect, communication, and logic. It is also the color of happiness, cheerfulness, and enthusiasm. Yellow can also be used to help with focus and making decisions, as it is a color of clarity. This is a color of choice if you want to brighten people’s moods and uplift them. If you are a company that wants to promote fun or entertainment, then this is a great color to use. It stimulates creativity and playfulness in individuals. However, it is important to keep in mind that too much yellow can lead to anxiety or nervousness. Therefore, it might be best to use it sparingly. Another point for consideration is the shade of the yellow, as a dirty mustard yellow will not have the same positive effect that a sunshine yellow will have. Yellow is a great color to use for point of sale purchases because our eyes are drawn to the color yellow. 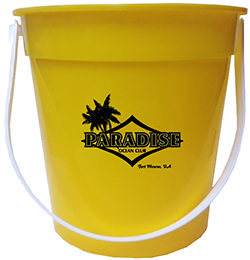 This makes yellow a great choice at tradeshow events where you might want to capture potential customers’ attention. Here are some examples of previously made promotional products using the color yellow to give you a taste of what MRL can create for your company.